Wind power has been dealt a huge blow in recent years due to insufficient grid connections. The number of available transmission lines around the world can’t cope with the rate in which turbines are coming online, meaning power generation is wasted. Generators need to ensure a secure and economical flow of power to their customers. Image courtesy of FreeDigitalPhotos.net / xedos4. Wind turbines are being developed at a faster rate than pylons. Erik Bystrup of Bystrup Architecture, Design and Engineering. The continental US power transmission grid consists of about 300,000km of lines. Offshore wind farms require expensive submarine cables to connect to the grid. Image courtesy of Ben Barden / Vattenfall. Freddie Andreasen, director of power systems for Vestas Technology R&D. Bystrup Architecture, Design and Engineering is investigating new pylon designs which are cost effective and aesthetically pleasing. Time spent installing wind farms could be time wasted as grid connections continue to lag behind the rate of new projects coming online. In China, the world leader in wind power in terms of installed capacity, more than half of the electricity generated by its wind farms goes unused. A report by the China Renewable Energy Society revealed ten billion kilowatt hours of power were wasted in 2011, resulting in unrealised revenue of $793m because of insufficient grid connections. Installed capacity of wind power in the US was more than 40,000MW in 2010, but electricity generation there is growing four times faster than transmission, making it almost impossible for energy companies to distribute total power production to their customers. Meanwhile, in Germany, 150GW-hours of wind generated electricity was lost in 2010, an increase of up to 69% during the course of a year, because of turbines being taken off the grid to stabilise power supply, according to statistics from the German Wind Energy Association (BWE). Hermann Albers, BWE president, commented on the figures released in January 2012: "Valuable carbon-free power is being lost because grid expansion has been moving too slowly for years. If we keep in mind that 2010 was a relatively weak year in terms of wind, we can expect this trend to continue over the next few years." It seems that power companies around the globe are working hard to meet renewable energy targets by building new projects, but the lack of grid upgrade works are taking the wind out of their sails. "The technologies needed to make a smart grid work, however, already exist and many wind plants can comply with smart grid requirements." There are several reasons why grid upgrades continue to lag behind the growth of wind power projects, one being the discrepancy in time between planning and building wind turbines and transmission lines. Erik Bystrup of Bystrup Architecture, Design and Engineering, a developer of transmission towers based in Denmark, explains: "Permission to build a wind farm can be obtained much faster than permission to build a transmission line. This is a major problem in Germany where you will need up to 4,000km of new transmission lines in the near future to connect to the new energy producing installations." Bystrup believes that society’s negative attitude towards pylons can slow planning permission down: "There is no understanding and acceptance of the structures carrying the power, in my opinion, mainly because the communication between the TSOs [transmission system operators] and the public over the years has failed." "The general attitude is that the windmills produce green energy, and that is of course positive, even if they are noisy, but the transmission systems still look as structures from the last century; dangerous, noisy and hostile," adds Bystrup. Before plans for the construction of pylons and transmission lines are approved, TSOs require generators to comply with stringent standards in order to ensure safe, secure and economic functioning of the electric system. "Meanwhile, in Germany, 150GW-hours of wind generated electricity was lost in 2010, an increase of up to 69% during the course of a year." These standards are defined by a Grid Code, says Freddie Andreasen, director of power systems for Vestas Technology R&D: "If you don’t have any requirements, then you can just erect turbines without having to care about power system stability, let’s say, which will enable a stable distribution of power." Grid impact studies are also required in order to understand if the grid is capable of receiving the amount of power which generators wish to deliver from their projects. Another reason why grid expansions are progressing at a slower rate than new turbine installations is the need for expensive submarine cables as more wind farms are built offshore. The basic functional requirements of an offshore and onshore wind farm are the same – to transmit the energy produced to a point where the electric transmission grid is strong enough to absorb it. But, alternating current, which the turbine produces, can only travel so far before energy is lost, says Andreasen: "There is a level of how far you can go with AC. I think it’s normally about 20km and then the losses will simply be too high. In order to compensate for that you have to transform the power into what we call a direct current, which is quite an expensive technology." 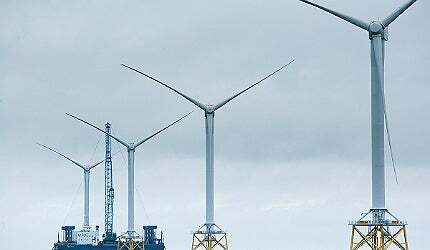 "The ambitious offshore plans around the North Sea is all connected to what we call HVDC and there are very few companies that supply this kind of technology, but this is a must-have in order to enable the offshore strategy in the UK," adds Andreasen. It is important that national grids are expanded to allow more wind capacity and prevent further power losses, but how can generators ensure a constant flow of energy once their farms are hooked up? The variable nature of wind is often perceived as a challenge in operating electricity systems, but according to Andreasen, this is not the case. "We can do a lot to be predictable by forecasting and knowing the weather conditions and also combining wind with storage," says Andreasen. Ancillary services are also important when it comes to connecting power generation to the grid. Technologies, such as voltage and frequency control, can prevent instability and power dips in the system. Andreasen explains: "It’s all about thinking about the wind power plant rather than specific wind turbines because a single turbine will never be able to perform on par with a communal power plant. "If you combine wind turbines in the plant and add advanced Power Plant Control functionalities to orchestrate the turbines as one unit, then we will be able to perform in the same manner as traditional power plants." "In China, the world leader in wind power in terms of installed capacity, more than half of the electricity generated by its wind farms goes unused." Smart grids are being developed in communities around the world to make the flow of electricity, whether it is generated from coal plants or wind farms, more reliable. Demand for energy is growing a pace, but if the expansion of transmission systems continues to lag behind the development of new projects, smart grids will be required to control the production and consumption of this energy in order to prevent blackouts. Smart grids are only one piece of the puzzle. Other solutions for a properly working green energy production system include renewable energy storage, but due to high battery prices, this technology is considered to be too expensive for commercial use. The technologies needed to make a smart grid work, however, already exist and many wind plants can comply with smart grid requirements. The challenge now is implementing price differentiation on electricity which is dependent on supply capabilities rather on demands. "Diverse cost prices will drive implementation of the needed technologies and change consumer behaviours," says Andreasen. "Smart grid technology is all about saving capacity for when we are close to the limit."